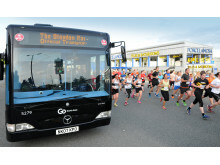 The region’s biggest bus company, Go North East has brought five newly branded buses onto the roads of Newcastle to mark one of the city’s most legendary events – the Blaydon Race. 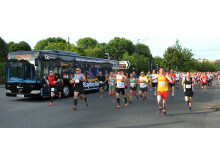 The standout buses, which travel the race route from Newcastle city centre to Blaydon, were officially launched to passengers and race-goers last Friday (9 June 2017) to coincide with the famous 5.6 mile road-running event. Proudly displaying lyrics from the well-known Geordie folk song ‘Blaydon Races’, the single deck ‘Blaydon Racer’ buses have been transformed as part of a £650,000 investment programme by Go North East into refurbishing 36 vehicles. Now featuring leather seats, under-seat lighting, audio-visual next stop announcements and free wi-fi access, the environmentally-friendly buses offer passengers of the popular route a comfortable and convenient journey along Scotswood Road. Stephen King, head of commercial and retail at Go North East, said: “Our passengers know how much pride we take in branding our buses and to launch the Blaydon Racer service on the day of the institutional North East event was perfect timing. 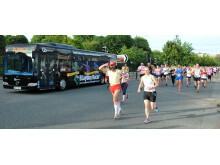 The Blaydon Racer buses run on services 12 and 12A along the route of the Blaydon Race.